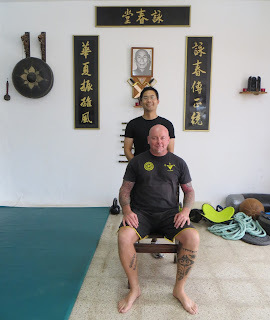 While on vacation to the Canary Islands, I had the pleasure and privilege of visiting Sifu Peter Grustad of Wing Tsun Academy Canarias on October 16th. Just prior to the trip to the Canary Islands, a YouTube video from Wing Tsun Gran Canaria showed up on my feed. Was this fate or just plain data collection by Google? So, what else to do but to search for "Wing Tsun Gran Canaria" and finding the website http://wtacademycanarias.com? Asking Si-Fu Ralph Haenel of WT Vancouver about Sifu Grustad reveals the fact that they had trained together at previous European seminars. I had a friendly e-mail correspondence with one of Sifu Grustad's students, Tobi, to arrange a visit in between all the sightseeing. Following a short morning hike in Tejeda, it was about a 1 hour and 20 minute drive with narrow roads and hairpin loops down the mountain. Google maps led the car to an area just east of the Maspolamas sand dunes, on the south side of the island. An unusual cloudy day for the island. While driving into Camping Pasito Blanco, I saw a yellow banner with a familiar logo bearing the letters, WT. Now, on foot, I was drawn by another nearby WT sign, pointing to the left. I had seen pictures of the WT studio on the website, so I had a little idea (hey look at that, my first WT pun) about what it looked like. Sifu Peter Grustad introduced himself, along with his equally friendly dog, some type of a cross with a Daschund. 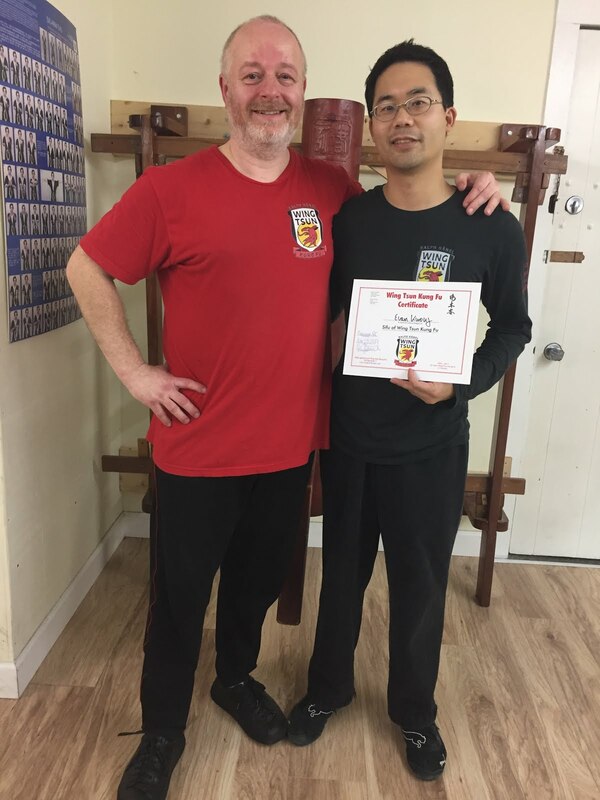 My immediate impressions of Sifu Grustad: a strong and confident build with a friendly presence. Thinking about it now, this was the second time I had met someone after I first saw them on a YouTube video (see this posting for the first). A seemingly familiar encounter, yet still a completely new experience. Firstly, I was amazed by the training facility. After a short bow, I was led into a large outdoor shaded training area. A small punching bag, half-tires, equipment for some agility and strength building. Sometimes distinct smells are part of one's experience, but all my nose sensed was the fresh air of the island. After all, this entire martial arts studio overlook the ocean. Walking indoors revealed a vast area for training. The WT wooden dummy was recognized across from the entrance. A large training mat sat below swords and weapons hung on the wall, with a photo of Yip Man above. Kettlebells and other weights also lay on the ground. My eyes were also drawn to a large painting of Yip Man with a long pole, where a heavy punching bag also hung. Walking to the left several steps, I couldn't help but notice a German copy of GM Kernspecht's "On Single Combat" on the coffee table. A brief look at a wall of photos revealed the close influence on Sifu Grustad's WT from Sifu Emin Boztepe and Sifu Heinrich Pfaff, and of course GM Kernspecht. Behind there was a weight-training gym. After some further chatting, it was time for a private lesson. The generator was started up... and cue some training music - This Aint The End Of Me (White Comic). Sifu Peter Grustad asked me what I wanted to work on, and I asked him whatever student's usually lack. We could've gone through some Chi Sao sections, but he said that there are always different variations, something Si-Fu Ralph Haenel frequently reminds us about. Then, as we started with Chi Sao training, he diagnosed the gaps in my structure and provided advice on improving the WT deformations. WT Vancouver students will be familiar with the first several seconds of a PT with Si-Fu Haenel, where an "engine check" of all of our deformations reveals inadequacies. I felt the same here! Do you remember how we are told that the first Chi Sao section is important, if not the most important? I can only say we tried to start with that! Then it was time to tune up the structure. I felt that I knew little WT once again. It wasn't the few pounds I had gained from eating all the Sepia and Pulpo a la plancha, and Patatas con mojo. I don't think I was nervous either, even though I remember feeling flabbergasted that it is pretty fortunate not only meeting but also learning from someone of the same WT generation as Si-Fu Haenel! I remember thinking in my mind, a first technician grade should have more structure than this. What's going on with my body mechanics today, and where was my forward springy pressure? Have I been trying to practice too much of the minimizing pressure and signalling, and now I have shifted into a weak withdrawing phase again? Was I not just the other day in Vancouver the opposite, stiffly holding my positions too much and being uprooted? The lesson made me realize a couple of points in my own training. We are taught that throughout our WT journey there is a bandwidth of performance, how we may fluctuate being in the strong/rooted phase vs. the soft/mobile phase, in order to find that right fluid elastic powerful balance. But, in reality, we end up actually being in a stiff/holding vs. weaker/collapsing phase. I think recently I have been in the latter phase, as evidenced by the diagnoses of my deficiencies by Sifu Peter Grustad. On first contact and working ever so slowly and slightly, he felt where my imbalances were situated. Do you remember the feeling of imbalance when Si-Fu Haenel just lays one or two hands on your arms? It was the same experience. The most important part of visiting another WT/WC school? Listening. Boy was it worth it. I received very valuable ideas and concepts to help my training, again much more important over just learning any techniques. Another impression was the familiarity of teaching styles. I felt the angles and structure from Si-Hing Asad Mir of WT Toronto, fluidity and fine control from Sifu Ralph Haenel of WT Kung Fu Vancouver, and the useful mechanical metaphors from Sifu German Ferrer of Calgary Wing Tsun. I'm a thinker when it comes to learning, and the tips that were given to me really helped me activate my muscle chains. Sifu Grustad was patient and taught slowly with ideas on how to improve my structure. For example, literally millimetres of adjustments to my bong sao allowed less pain in the shoulder, and in return a better connection for absorption/redirection, but still allowing mobility in the shoulder girdle. Throughout the lesson, using such weapons as spears, fencing epee, and Escrima sticks, analogies were made whereby emerging connections occurred in my brain. Another important point is taking any training drill and asking "why?" and "what is the point of this drill?" Si-Fu Haenel always tells us to make sure we analyze ourselves and our training. When asked by Sifu Grustad about certain drills, I do not recall giving a clear concise answer. I remember even giving him a very long-winded complicated answer once. One example is the Pak-Sao drill from Chi Sao Section 1 that I realized I haven't done since my IWTA days. Do you also remember how Si-Fu Haenel reminds us often about (not exactly his words) "how the arms move in front of the body but also the body moving behind the arms"? Sometimes it takes a different drill to make that neural connection, and Sifu Peter Grustad's explanation of this drill helped me with this concept. I have been trying to formulate a model to explain the redirection and counters in WT, with a stick attached to a sphere, and some of what Sifu Grustad mentioned helped me with another step in this direction. Thank you! 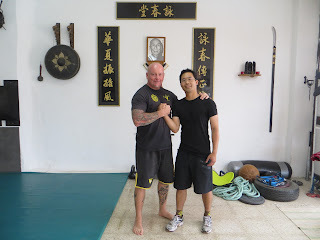 It was quite a privilege to train with a Sifu of the same generation as Si-Fu Haenel. Actually, many things about Sifu Grustad remind me of Si-Fu Haenel: strong, but fluid, and timely controlled power. And a great sense of humour. What did I learn? Back to the basics again. Analyzing and asking why, cataloguing the drills to build certain skills. Unfortunately, I did not have time to visit for longer, nor attend the group class held the next evening. As I left the studio though, I ran into two WT students Tobi and Martin. Just a few words of exchange, and I could feel the friendly but serious training environment at the school. I also didn't ask for good WT stories from the largely attended European seminars back in the 1990s. Perhaps another day, when I take a 16-hour journey to Spain again. If you are going to the Canary Islands (which is highly recommended), then you must contact Wing Tsun Gran Canaria and find Sifu Peter Grustad. You won't be disappointed.